TfL has rejected an ad for delivery firm Farmdrop because of imagery of fresh produce. Transport for London's definition of junk food has resulted in a seemingly draconian decision to rebuff an ad bearing images of fresh bacon, eggs and butter. 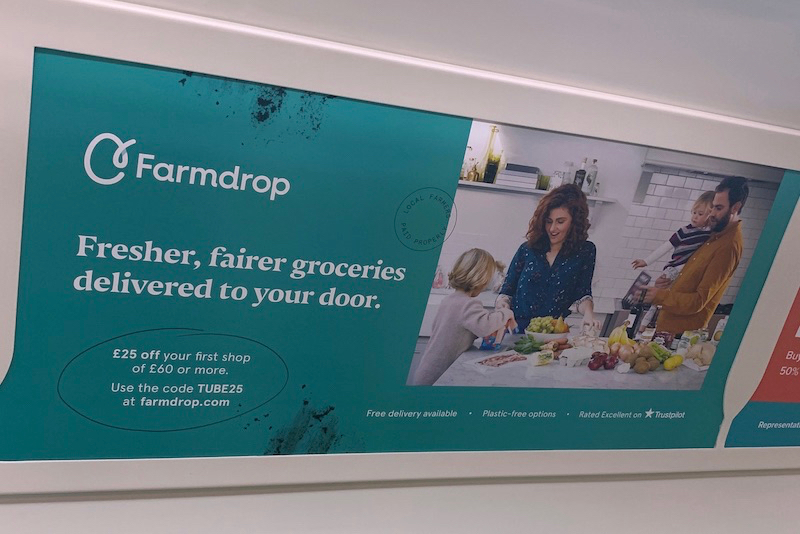 The work submitted by produce delivery firm Farmdrop has been rejected by TfL because it contains imagery of foods high in fat, salt of sugar (HFSS), which typically constitute heavily processed products such as fizzy drinks, crisps and chocolate bars. The ad in question featured a photograph of a family's kitchen table, on which is an array of fresh food including containing bacon, butter and eggs. The image has been cut to remove those products in order to pass muster. According to Farmdrop, it was told by TfL sales agent Exterion that the foods were "not high fat, sugar and salt compliant". In a blogpost on its website, Farmdrop wrote: "Naturally, we were pretty shocked that a picture of some fresh groceries with a healthy mixture of fruits and vegetables, dairy, eggs and cupboard staples would flout TfL’s new junk food rules. "But it turns out that TfL scores foods individually according to a nutrient profiling model created by the government. It’s a pretty crude measure and means that foods you would still think of as junk, like fizzy drinks with artificial sweeteners or low-fat fried foods, could in some scenarios comply with the new regulations." The company pointed out that TfL adheres to the standards of the Advertising Standards Authority. "According to the ASA, a McDonald’s Happy Meal is not a junk food product because 80% of the mains, and 100% of the sides are non-HFSS," Farmdrop said. "But swapping out sugar for a sweetener or fruit for chips, doesn’t detract from the fact that this is still a fast-food company promoting meals with fried foods to kids." Introduced by Mayor of London Sadiq Khan, the ban on junk food advertising has been met with no shortage of controversy. The Advertising Association has warned that regulation is "complicated" for advertisers, while TfL has promised to help brands win exemptions if they get caught up unfairly in the "unintended consequences" of the ban. Farmdrop has applied for an exception to the rule, but a "decision won't be made soon enough for this campaign". The company said that it fully supported Khan's ban, but was concerned as to how it was being implemented. How can the ad industry be so dumb when it comes to artificial intelligence?